The Third Edition of this bestselling title is packed full of real-world advice for researchers and students. It is an invaluable introduction to the theoretical and practical essentials needed to design, conduct and appraise qualitative research in health. The book highlights core research skills, taking the reader through the key debates in qualitative methodology. It sets out a logical, easy-to-follow path supported by practical examples ensuring you will find it engaging and relevant. - expanded summaries, key points and reflective questions designed to help students apply theory to their own research. Clear, thorough and articulate, this is an authoritative introduction to qualitative research for all health professionals and students. Visit the accompanying companion website for additional resources. Judith Green is a Professor in Sociology of Health at the London School of Hygiene and Tropical Medicine. Nicki Thorogood is a Senior Lecturer in Sociology at the London School of Hygiene and Tropical Medicine. 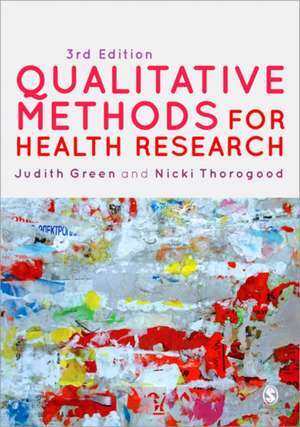 Revised and updated for a third edition, Green and Thorogood’s excellent textbook provides a solid grounding for health professionals in the theory and practice of qualitative research methods. This new edition, with an increased focus on data management and analysis, will remain the core qualitative methods textbook for our Master in Public Health Programme.